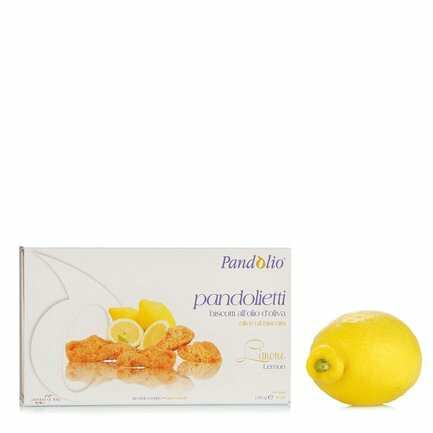 For gourmands seeking a wholesome biscuit that is also refined and delicate, Pandolio has created this delicious lemon variety, which are perfectly served with afternoon tea or after dinner with a good white wine. The light and crumbly texture is achieved using wheat flour, sugar, olive oil, white wine and lemon juice. Serve Pandolietti to your guests to experience the full flavour of an authentic Ligurian recipe. Ingredients Wheat flour, olive oil 21.7%, sugar, white wine (contains sulphites), lemon juice 3.5%, flavourings: lemon flavouring. Raising agent: disodium diphosphate, bicarbonate of soda. Produced in a factory that also uses nuts, milk and eggs. For more information on product labels, please contact our Customer Service department. The information on the labels of the products may vary for reasons beyond our control, therefore, there may be discrepancies between the information on the site and that on the products delivered. Please always check the information on the product before consumption or use. Eataly invites you to discover the traditional and authentic flavour of the products made by Pandolio, a small firm in the enchanting San Bartolomeo al Mare on the Ligurian coast that produces a range of confectioneries, biscuits and delicious savoury foods in full compliance with the regional historic recipes, which are distinguished by the use of olive oil as a key ingredient. The Pandolio, from which the name of the company derives, is an evolution of an historic confection from the province of Imperia called Stroscia, which was made by recovering extra virgin olive oil deposits and blending them with sugar and flour. Today as in the past, Pandolio offers the exquisite flavour that is a hallmark of studied simplicity.